The key is a new approach to making supercapacitors—devices that can store and release electrical power in such bursts, which are needed for brief transmissions of data from wearable devices such as heart-rate monitors, computers, or smartphones, the researchers say. They may also be useful for other applications where high power is needed in small volumes, such as autonomous microrobots. Nanotechnology researchers have been working to increase the performance of supercapacitors for the past decade. Among nanomaterials, carbon-based nanoparticles—such as carbon nanotubes and graphene—have shown promising results, but they suffer from relatively low electrical conductivity, Mirvakili says. "Imagine you've got some kind of wearable health-monitoring system," Hunter says, "and it needs to broadcast data, for example using Wi-Fi, over a long distance." At the moment, the coin-sized batteries used in many small electronic devices have very limited ability to deliver a lot of power at once, which is what such data transmissions need. "Long-distance Wi-Fi requires a fair amount of power," says Hunter, the George N. Hatsopoulos Professor in Thermodynamics in MIT's Department of Mechanical Engineering, "but it may not be needed for very long." Small batteries are generally poorly suited for such power needs, he adds. "We know it's a problem experienced by a number of companies in the health-monitoring or exercise-monitoring space. So an alternative is to go to a combination of a battery and a capacitor," Hunter says: the battery for long-term, low-power functions, and the capacitor for short bursts of high power. Such a combination should be able to either increase the range of the device, or—perhaps more important in the marketplace—to significantly reduce size requirements. The new nanowire-based supercapacitor exceeds the performance of existing batteries, while occupying a very small volume. "If you've got an Apple Watch and I shave 30 percent off the mass, you may not even notice," Hunter says. "But if you reduce the volume by 30 percent, that would be a big deal," he says: Consumers are very sensitive to the size of wearable devices. The innovation is especially significant for small devices, Hunter says, because other energy-storage technologies—such as fuel cells, batteries, and flywheels—tend to be less efficient, or simply too complex to be practical when reduced to very small sizes. "We are in a sweet spot," he says, with a technology that can deliver big bursts of power from a very small device. Ideally, Hunter says, it would be desirable to have a high volumetric power density (the amount of power stored in a given volume) and high volumetric energy density (the amount of energy in a given volume). "Nobody's figured out how to do that," he says. However, with the new device, "We have fairly high volumetric power density, medium energy density, and a low cost," a combination that could be well suited for many applications. Niobium is a fairly abundant and widely used material, Mirvakili says, so the whole system should be inexpensive and easy to produce. "The fabrication cost is cheap," he says. 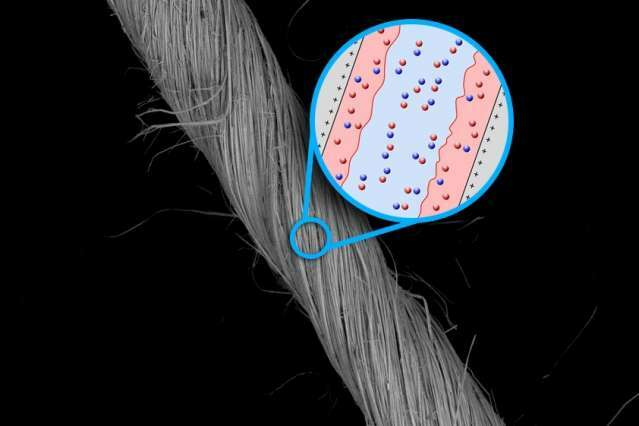 Other groups have made similar supercapacitors using carbon nanotubes or other materials, but the niobium yarns are stronger and 100 times more conductive. Overall, niobium-based supercapacitors can store up to five times as much power in a given volume as carbon nanotube versions. Niobium also has a very high melting point—nearly 2,500 degrees Celsius—so devices made from these nanowires could potentially be suitable for use in high-temperature applications. 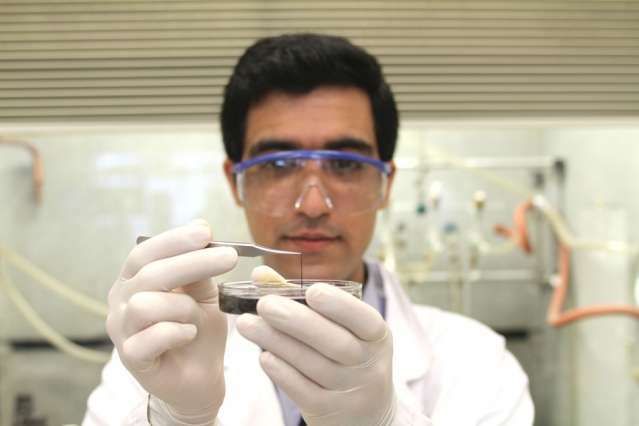 In addition, the material is highly flexible and could be woven into fabrics, enabling wearable forms; individual niobium nanowires are just 140 nanometers in diameter—140 billionths of a meter across, or about one-thousandth the width of a human hair. "The work is very significant in the development of smart fabrics and future wearable technologies," says Geoff Spinks, a professor of engineering at the University of Wollongong, in Australia, who was not associated with this research. This paper, he adds, "convincingly demonstrates the impressive performance of niobium-based fiber supercapacitors." High temperature applications of niobium - but using polymers? Perhaps without the polymer coatings. 30% decrease in mass or volume? I bet 30% decrease in mass would be more noticeable than 30% decrease in volume (equivalent to - 9% length scaling). Niobium yarn being more conductive and stronger that carbon nanotube? May be at the moment, but nanotubes/graphene have the best intrinsic strength and conductivity in the metallic state over any other material. My bet is on carbon winning this battle. This article shows the gap is there to be made up.